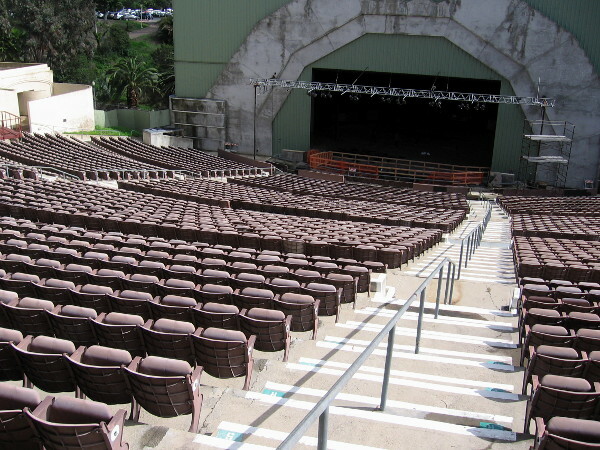 starlight bowl – Beautiful Balboa Park! Starlight Bowl’s restoration is looking good! 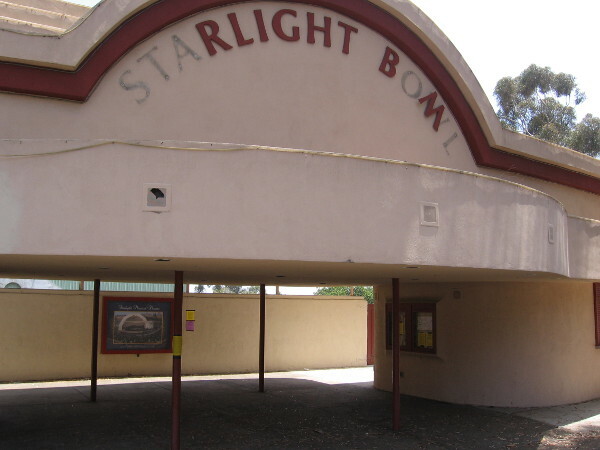 The Starlight Bowl in Balboa Park has been cleaned up and the rear wall brightly repainted. Almost ready for an audience! I walked around the Starlight Bowl today and was super excited to see the progress of its restoration. No weeds and a fresh coat of paint–and a clean, inviting appearance! After years of sorry neglect, what a positive change! Thanks to the folks at Save Starlight and many hardworking volunteers, this beloved outdoor venue in Balboa Park appears well on its way to creating more happy memories! The weeds are gone and the seats look welcoming. It appears some work is being done on the Starlight Bowl stage. I want to see an outdoor performance! Under the stars! Posted on February 19, 2017 February 19, 2017 Tags activism, balboa park, construction, entertainment, history, hope, optimism, san diego, starlight bowl, volunteers1 Comment on Starlight Bowl’s restoration is looking good! Help save the historic Starlight Bowl in Balboa Park! 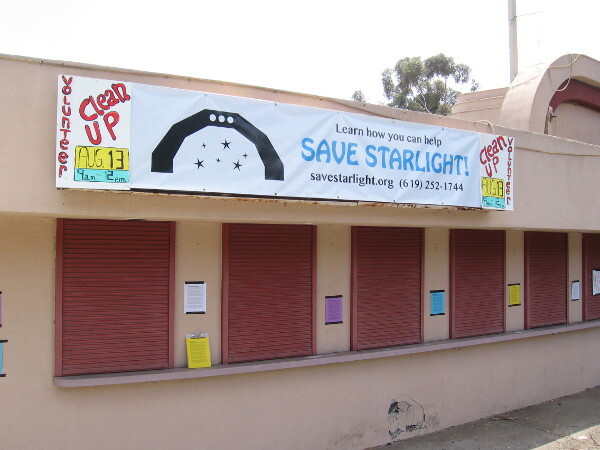 Banner above shuttered box office windows of Balboa Park’s vacant, neglected Starlight Bowl asks volunteers to help clean up and save the Starlight! A new effort is underway to save the historic Starlight Bowl! 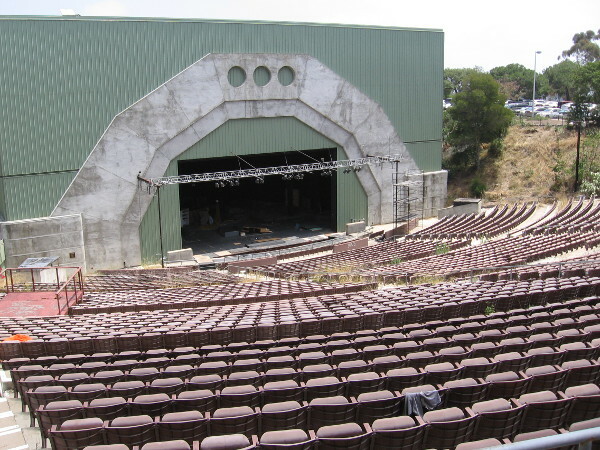 You might recall that I blogged a couple years ago (on my main blog Cool San Diego Sights) about how the beloved outdoor venue and cultural treasure tragically fell into disuse. 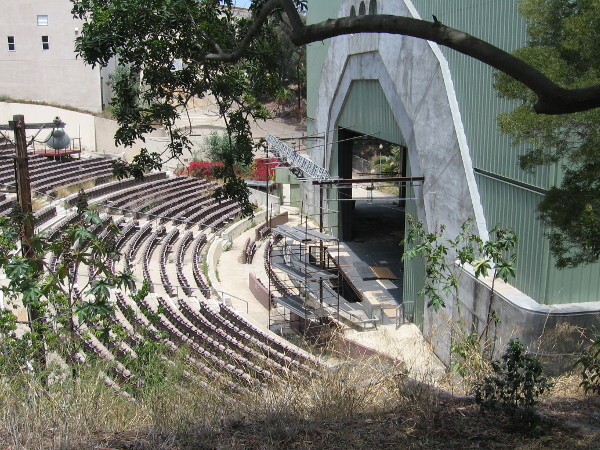 I still remember watching musicals performed in this wonderful outdoor amphitheater when I was young! Well, today, while walking through Balboa Park, I spotted something exciting! Here are the photos! A cleanup is scheduled for August 13 and supporters are being sought to help restore the Starlight Bowl to its former glory! Please click the image that contains loads of information–it will enlarge so that you can read it! Here’s a link to the website SaveStarlight.org where you can learn much more and join the effort! My calendar is marked for the cleanup day! 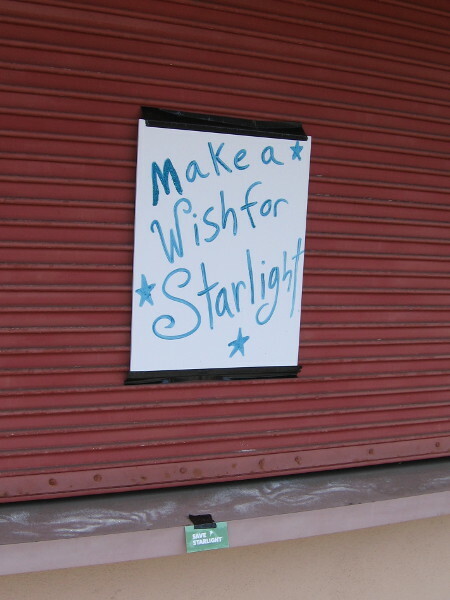 Make a wish for Starlight! Better yet, lend a hand to help restore this Balboa Park and San Diego cultural treasure! Photo over the surrounding wall shows weeds, garbage and disarray at the venerable old Starlight Bowl. Vagrants and youth sometimes jump the fence and run riot in the now dark stage area. The San Diego Civic Light Opera went bankrupt four years ago. The Starlight has been abandoned ever since. 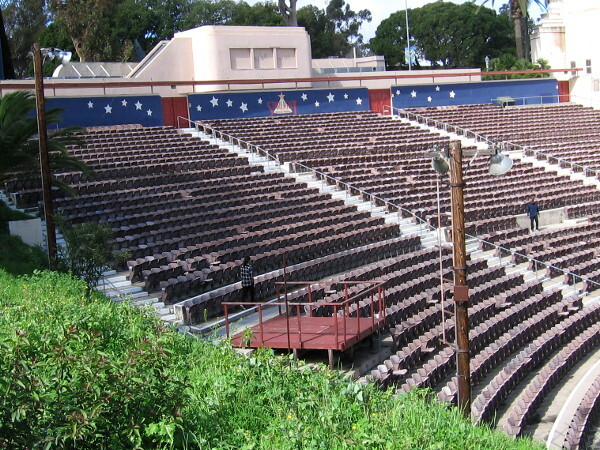 Many San Diegans have fond memories of watching outdoor theatrical productions here. Looking down at a San Diego landmark that is slowly decaying. If you’d like to help restore the Starlight, please, please, please spread the word! Are you a blogger? Do you want to make the world a better place? Please join Bloggers Lifting Others Generously. 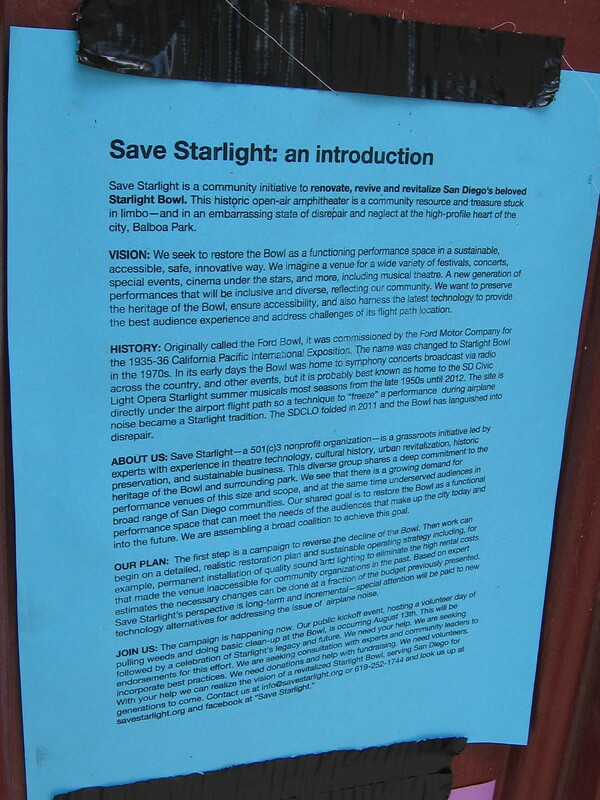 Posted on June 26, 2016 Tags activism, balboa park, culture, events, history, hope, san diego, starlight bowl, theatre, volunteersLeave a comment on Help save the historic Starlight Bowl in Balboa Park!